AMSG’s Quality Management System (QMS) provides internal procedures to ensure quality management of all deliverables. For all work, the assigned AMSG PM ensures all team members are familiar and comply with QMS requirements. As a practice, AMSG adheres to ISO 9001:2015 standards as a provider of premium products and services. 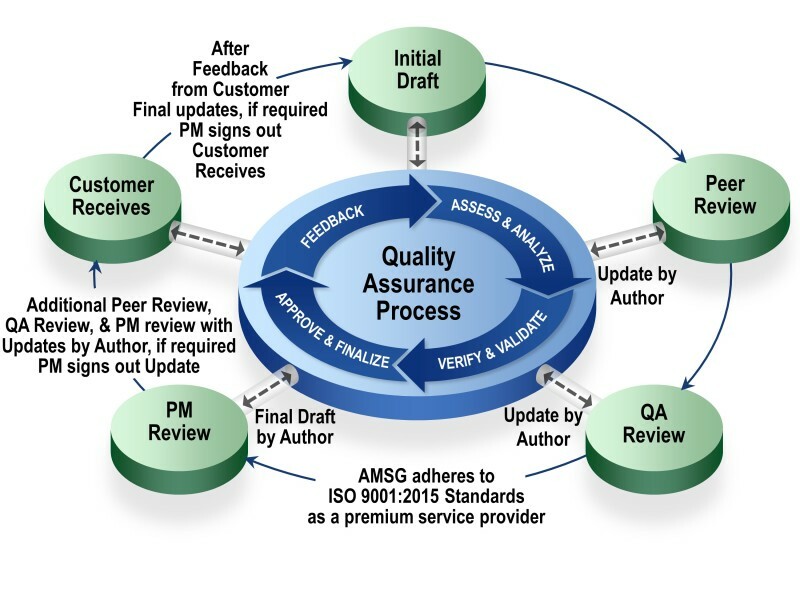 The assigned AMSG PM and team use our formal quality assurance process as illustrated in the figure below, ensuring all Team members are familiar and comply with quality requirements. The AMSG PM develops a Quality Assurance Plan (QAP), observing procedures and processes, and then samples employee performance. For all Task Orders/Contracts we deliver our final QAP to the COR within 15 business days of contract award. In all cases, the AMSG PM requires every member of the team to review and understand the provisions of our QAP before they begin work under the contract. Each member of the team understands that they are directly responsible for compliance with the QAP, which ensures we provide the highest quality products and services to the customer. All deliverables are subject to the QAP, including those prepared by subcontractors, and undergo quality reviews by: Preparer, Peer, Task Leader, and PM. For our overall approach, we developed this Quality Control Plan (QCP), along with a number of supporting Standard Process and Procedure (SPP) documents, and these are applied to each of our efforts. (SPPs are identified for each Project or task Order we execute). The QCP and SPP documents take the general ISO quality requirements and tailor them for use and application specifically to the type of business in which we are engaged. They lay out a set of general requirements that apply to all projects executed by the organization. Based on these guidance documents, additional focused and detailed plans are developed for each project under execution, based on the unique requirements of the project. AMSG further ensures quality standards and reporting requirements are embraced by all team members on behalf of the AMSG as the Prime, ensuring a consistent and high level of quality conformance throughout the performance of work. AMSG’s Quality Control (QC) approach is proactive. We observe and sample employee performance so that we can predict and resolve issues before they become a problem. Our PM has principal responsibility for development and execution of the Quality Control Plan (QCP). For all Task Orders/Contracts we deliver our final QCP to the CO within 15 days of contract award. In all cases, the AMSG PM requires every member of the team to review and understand the provisions of our QCP before they begin work under the contract. Our self-monitoring process ensures each employee is briefed on any QCP changes or special requirements for quality reviews for deliverables. Each member of the team understands that they are directly responsible for compliance with the QCP, which ensures we provide the highest quality products and services to the customer. All deliverables are subject to the QCP. All deliverables, including those prepared by subcontractor, undergo a stringent quality review that includes: Preparer, Peer, PM, Task Leader, and PM Review. These quality processes are in addition and comply with those identified the Government QASP. Our process ensures a stringent quality review process for deliverables. In all cases AMSG executes the quality performance objectives outlined in the Government’s QASP. All tasks are completed in accordance with the Government guidelines to include meeting all scheduled delivery requirements as outlined in the deliverables and supporting Contract Data Requirements List (CDRLs) identified in the awarded contract. ​AMSG believes effective QC identifies deficiencies before they impact on products and services. To that end, our approach to QC dictates that we have a process for immediate correction of identified deficiencies. Our intent is to solve all problems or fix any identified weaknesses at the lowest level possible. Our plan includes a means for employees to identify any deficiency, problem, or issue. We use a Quality Control Working Group (QCWG) chaired by the Project Manager/Task Lead, any subcontractor Task Leaders, and AMSG Team Leads as well as subcontractor Team Leads performing QC duties as collateral and separate duties. The purpose of the QCWG is to continuously improve performance by reviewing mission support execution and performance at each level and within every functional unit of our organization. The QCWG executes the checks and balances of our QCP in order to assure the delivery of quality service to the customer. Our QCWG uses internal monthly reviews to discuss and monitor the progress on the Task Orders and any other discussion topics deemed appropriate. On the front end of Task Order execution there will be a much more frequent level of interaction until initial operations stabilize. Initially, these discussions will take place weekly and even daily as we stand up operations. Once the initial Task order execution phase is established, we will move into a sustaining operations pace and move to the monthly reviews. Review of the tasks executed over the past month and lessons learned to include what went right, what didn’t go as it should have, and what do we need to change. Discuss compliance with awarded Task Order requirements to include any CDRL submissions and deliverables. Review the near-term, short-range and long-range calendars. Review resources required in the upcoming month to ensure the timely achievement of all requirements of the current or upcoming Task Orders.